Russian opposition leader Alexei Navalny, pictured here at Moscow's courthouse in May, was released from custody on Thursday. He said on Instagram that the prison where he was held for a month has been decked out for World Cup fans. 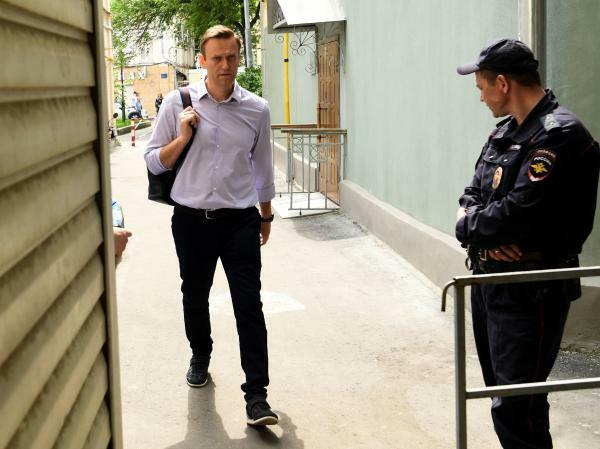 A Moscow prison has been beautified and accessorized as hundreds of thousands of soccer fans travel to Russia for the World Cup, opposition leader Alexei Navalny quipped Thursday upon his release from custody. A vocal critic of Russian President Vladimir Putin, Navalny was freed just ahead of the opening match between Russia and Saudi Arabia. Navalny, who called his prison stint a "30-day business trip," took to Instagram and posted an apparently sarcastic commentary about Russian preparations ahead of the World Cup — describing freshly painted cells, toilets in place of pit latrines and luxuries more likely to be found on college campuses than in Russian prisons. "They placed goalposts in the exercise yard and handed out real [soccer] balls" and equipped the cells with LCD screens so that soccer enthusiasts could watch the World Cup, he wrote. Meager prison meals became "better than in restaurants" with non-alcoholic beer, shish kebabs and tiramisu, according to Navalny's post. Female students wearing outfits that looked like "a cross between police and flight attendant uniforms" have been hired as interpreters. "Anticipating your 'I want to be arrested' comments," he wrote in the post, "I would like to note that the number of available seats is limited, and if you plan on violating public order you need to hurry up: after the World Cup is over, the golden carriage will turn back into a pumpkin." The Russian daily Moskovsky Komsomolets spoke to a Moscow City Council official who said that no such luxurious conditions exist at Moscow prisons. Navalny spent a month behind bars after calling on supporters take to the streets in protest of Putin's inauguration. The Russian constitutional court banned Navalny from running in the 2018 presidential race because of an embezzlement conviction, which the European Court of Human Rights considered "arbitrary." In anticipation of the World Cup, Russian authorities have taken "preventative measures" and cracked down on small signs of dissent, NPR's Lucian Kim reported. At Moscow State University, students upset that the official fan zone is located in front of the university's landmark main building said they were afraid to speak out. "Many students are scared of participating in protests since it carries the risk of administrative consequences, even criminal charges," a biology student told Kim. "There were instances when students declined to sign petitions because they could face punishment." After a World Cup sign at the university was defaced, two students were arrested during their exam. In a video address released by the Kremlin last week, Putin said, "We have done our best to ensure that all of our guests — the athletes, the staff and, of course, the fans — feel at home in Russia."